What is the future of the 10:30 worship service, especially with the newly allocated money in the budget? At the end of the summer, Bill Munson found his dream job in Duluth and is no longer our main Praise Team leader. His gifts were appreciated by the congregation and the Praise Team. Before he left, Bill and the Praise team added 16 new songs over the summer through the bracket challenge. In September, we entered an intentional interim period. This allowed us to consider what the 10:30 worship service will look like in the future and to explore how other churches, with a similar theology to Faith Lutheran, approach contemporary worship. We are not looking to replicate the “rock band” experience you might get at a megachurch, but we need to be aware of the musical expectations of prospective members and those seeking a relationship with God—especially someone who might not have a church background or is new to a theology of grace, but loves the music they hear on KTIS. In December, I formed a small committee of members of the 10:30 service to ask for their honest feedback and to encourage them to visit other Lutheran contemporary/praise team services. I intentionally wanted this small group to be made up of members who aren’t on the Praise Team to gain an outside perspective. In addition, I have had (and continue to have) conversations with the Praise Team to listen to their suggestions and let them know a committee was formed. On this committee are Tracey Daniel and Laurie Husfeldt from the council; Britta Dumke, who joined Faith in 2018; Tim Davis and Daniel Diemer; and Deacon Nina Joygaard. They have come to our sessions with open-minds to what the Holy Spirit is up to at Faith Lutheran right now. They’ve also enthusiastically sought out other places to worship and have shared these experiences with the committee. The members visited churches including The Depot in Hugo, Spirit Garage, Hosanna! in Lakeville, St. Andrews in Mahtomedi, and Shepherd of the Valley in Apple Valley. They made observations about style of services and what the congregations were like. They noticed most groups had a featured musician, often on guitar, who would help lead the singing and create an environment where the congregation could feel the Spirit. They noted how that lead musician would help in transitions between songs and had a welcoming presence beyond the preaching/presiding minister. At our 9:00 traditional service, our staff member, Linda Burk, is the primary point of contact. Linda brings in guest musicians like JD Steele and Sowah Mensah to Faith Lutheran. She stays current on the latest worship trends and is constantly in touch with me about the music selections on a Sunday. I review her suggestions and if I think a song is too unfamiliar or isn’t the right fit, she’ll adjust or recommend that we teach the congregation the song choice. Linda does continuing education and networking. One of the gifts with the Praise Team is that it is entirely led by volunteer members of Faith. The only paid position has been the pianist since I’ve been at Faith. The team does all the music planning and song selections. What a great and dedicated group this is and their passion for leading worship is obvious! One of the drawbacks, however, is that there isn’t a staff point person who is ultimately accountable to feedback or suggestions. Thus, when there is feedback or suggestions, they are directed towards me. A suggestion that I have heard consistently, from both members and former members, is that our 10:30 worship include a featured musician who leads (or coordinates others to lead) the congregation in worship and music. I’ve discussed this recommendation with Bill Munson and he shared an observation. 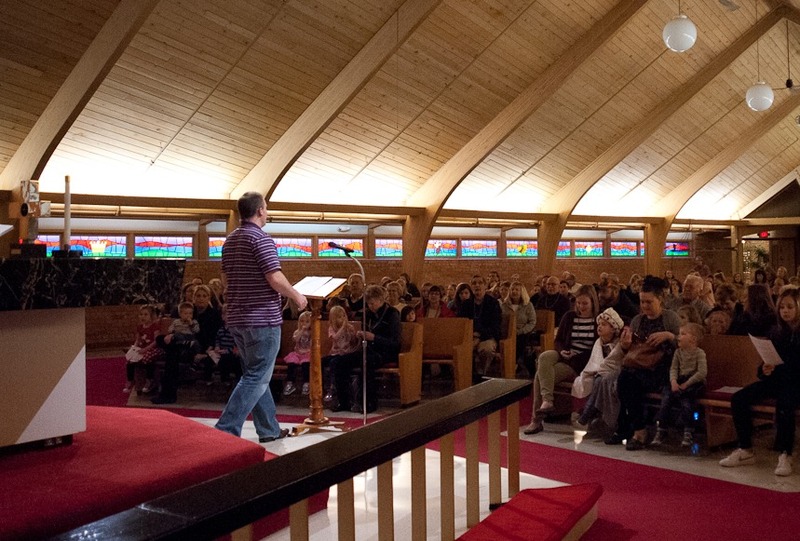 The best he’s ever heard the congregation sing (at either service) is when there’s one dominant voice—think about how well the congregation sang when JD Steele led us in songs that were unfamiliar, but easy to catch on. On February 10th, Bill and Kyle Trapp (a guitarist who grew up at Faith) will lead the 10:30 service in an intentional, stripped down style for our congregation to experience what an alternative worship style could sound and feel like. We have talented musicians in the Praise Team whose gifts are appreciated. Imagine how a new voice leading the 10:30 service might stretch all of us in ways we’ve yet to consider. Perhaps each week we will have different variations and sizes of the team based off of the recommendations of this worship leader. Like Linda does, I’d encourage this musician to network with other talented musicians in the Twin Cities to enhance worship. I’ve told the committee that this year’s budget reflects an opportunity to move forward with a 10:30 staff worship leader position. Yes, this is new, which can be intimidating… but there is also excitement about the possibilities. Quality musicianship and creative leadership will be essential characteristics in whoever interviews for this position. Bill Munson is willing to serve on the hiring committee—he understands the vision of Faith to grow and has the musical chops to discern the gifts of a candidate. In February, our 10:30 service committee will brainstorm what the position description of this individual would look like before making a recommendation to personnel. Will hiring a new worship leader mean change? Yes, but I’m optimistic that all of us who value the 10:30 worship service will be able to look back at this time as being the pivotal breath that led to important growth for our congregation. Thanks for your patience with this process and your enthusiasm for the shared ministry of Faith! I love that there are 2 different options for worship! Sometimes I like the contemporary songs but more often my family loves hearing the songs we listen to on KTIS. My kids are 2 and 4 and they’re always dancing and singing to the music! Yes, yes, and more YES! Bring on the so, so overwhelming never ending reckless change of God! He has been so, so good and kind! This is needed. Attendance at the 10:30 service has not increased appreciably. Marge and I have also experienced worship at EBC and did not find it welcoming or spirit filled. On the other hand we worshipped at St. Andrews where a worship leader lead singing which the congregation participated in with enthusiasm. Between songs the leader spoke words that connected the music to the lessons of the day. The worship space was full. I am so excited for this change! Life is full of change. It is time for the 10:30 service to have some.